This research article looks at the impact of incentives, personality types and gender on sharing intellectual wealth. 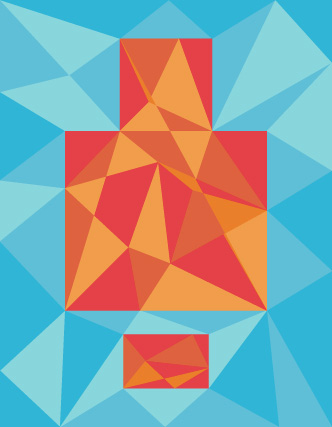 In an increasingly complex and unpredictable world, the development, exploitation and management of knowledge are the keys to building a competitive advantage for modern organisations. Most organisations have formal knowledge management initiatives that consists of information systems designed to hold and distribute codified knowledge. While managing knowledge is ostensibly critical to professional firms, it is implicitly believed that employees will share knowledge if they are provided with adequate infrastructure and incentives (Zack 1999, O’Leary 2002). This research is an attempt to investigate the impact of different personality types, various incentives and the role of gender on ‘knowledge hoarding’. Knowledge acquired during the course of one’s job belongs to the organisation rather than the individual. However, some individuals perceive this as their personal intellectual property and hence do not share it with others in the organisation. This phenomenon of not sharing information is defined as “Knowledge Hoarding”. A sample of 207 Indian corporate employees with an average experience of five years participated in this survey. 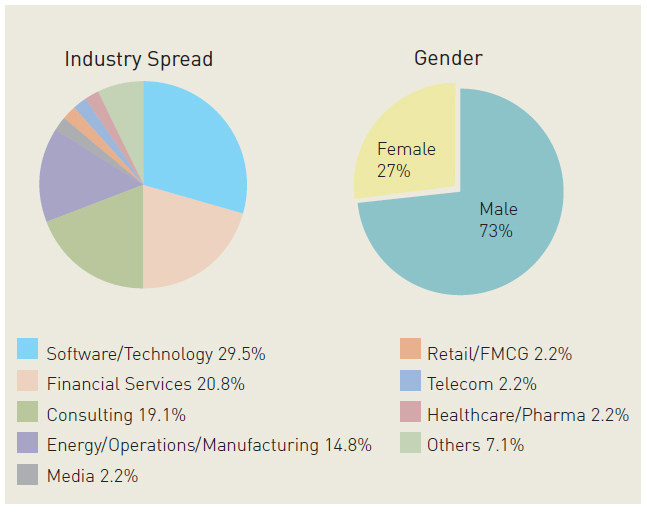 Respondents from a range of industries (spread indicated below) were invited to participate in the study. They were chosen randomly and cut across industries as illustrated. Each participant responded to a set of two written scenarios depending on the particular experimental condition to which they had been assigned. These scenarios described opportunities to share acquired knowledge with other co-workers that would enhance employee effectiveness and productivity. Responses were aggregated across the scenarios after removing inconsistencies and formed the input for further regression analysis. We evaluated two types of personalities – Self Monitoring people and Empathetic people. Self-monitoring theory is a contribution to the psychology of personality, proposed by Mark Snyder in 1974. The theory refers to the process through which people regulate their own behaviour in order to “look good”, so that they will be perceived by others in a favourable manner. Empathy, which literally translates as in feeling, is the capability to share another being’s emotions and feelings. Self-monitoring and empathetic personality types were measured using a modified version of the scale developed by Lennox and Wolfe (1984) . Contrary to popular belief, the presence of monetary and recognition-based incentives actually deters people from sharing knowledge with each other. 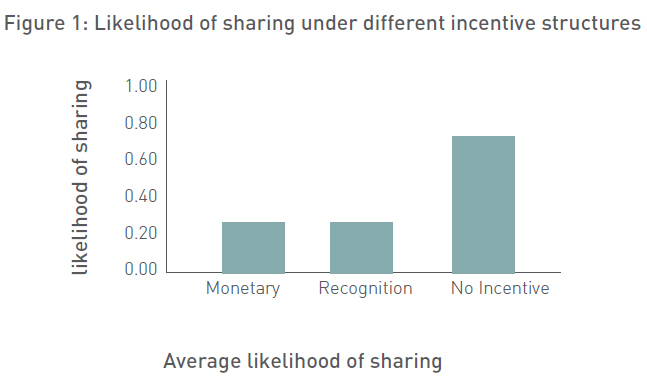 The graph below (figure 1) clearly indicates that the willingness to share knowledge decreases in the presence of these incentives. This is possibly because people do not want to be seen by their teammates as very competitive persons who only share when incentives are available. In addition, people do not want to be treated as “commodities”, to be controlled by providing incentives. This research has strong implications for organisations that are wastefully spending large amounts on incentives. They should rather understand the motivation of different employees to share knowledge and channelize their resources on providing incentives to the entire team. This might lead to a better culture of sharing amongst employees. We observed that personality has a very strong correlation with the willingness of people to share knowledge in the presence/absence of different incentives. 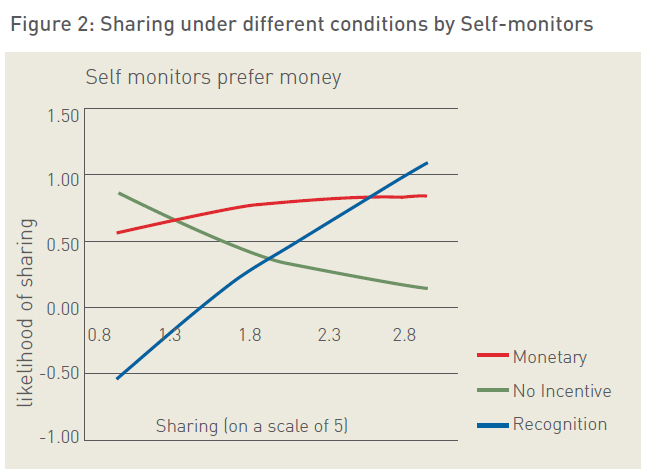 People high on self-monitoring tend to prefer monetary incentives, while people high on empathy tend to “dislike” monetary incentives. This is possible because people high on self-monitoring (impression managers) do not want to be “recognised” for sharing information since self-image management is critical for them. On the contrary, people high on empathy believe that monetary incentive is a “cold-blooded” reward from the company. The graphs above (figures 2&3) indicates the scenario for different incentives.This finding has strong significance because it highlights the importance of understanding the need for different incentives for different types of people. We also observed that the willingness to share knowledge varies between men and women. 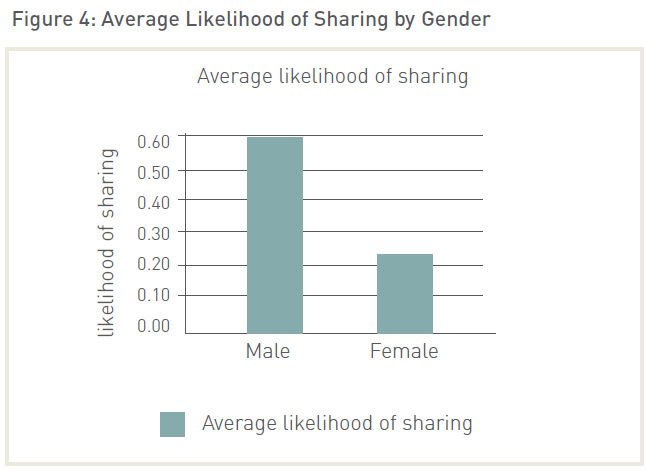 Women typically share less than men. This is probably because historically, women in India have been discriminated against in boardrooms, which has forced them to be over-competitive, so that they prefer to use knowledge as a weapon to differentiate themselves from their counterparts. Women may be wary of forging close ties and sharing knowledge with other male colleagues in the workplace. The graphs above (figures 4&5) indicate the same. 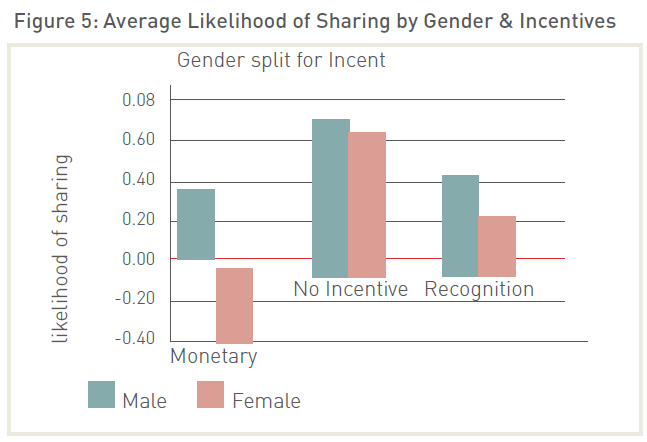 This finding again illustrates the fact that more and more female team members need to be included in knowledge management initiatives.In addition, when we tried to explore the interaction between gender and different incentive structures, we realised that in the presence of monetary incentives, women are less likely to share knowledge. This could possibly be because 75 percent of the women as per our survey were high on empathy and they possibly associate “guilt” with money. One key implication from this finding is that organisations need to understand “intrinsic” factors of motivation which drive men and women to share knowledge. Employees do not share knowledge either intentionally or unintentionally. For the purposes of this study, we have limited the research to intentional knowledge retention in corporate organisations. The study is also limited to two personality types and in the future, can be replicated across other personality types. This study has shown that organisations may be mistaken in believing that employees will share information if knowledge management systems are made available. Our research has highlighted the importance of understanding the motivations for knowledge sharing amongst employees. Managers need to understand the interaction between different drivers such as personality, gender, and incentives, amongst other things, to foster a strong culture of knowledge sharing in an organisation. Our study further suggests that organisations need not resort to costly monetary or recognition-based incentives for sharing to encourage free flow of knowledge. This research is a continuation of ongoing studies on designing effective knowledge management systems. It may be read in conjunction with other studies done in the past, especially in the Indian context, for a more holistic outlook. The research can be extended further by looking at the impact of other factors such as the nature of the organisation, employee’s association with teams and organisations, family background, religious beliefs etc, on sharing of intellectual wealth in an organisation. Student of the ISB, Class of 2010. Prior to joining the ISB, he was working with a Fortune 500 oil and gas consulting firm.